Remember my sheep? Here he is again, but snapped by a proper photographer this time. 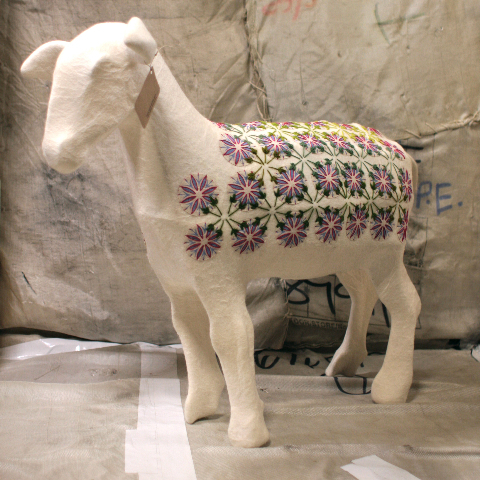 He'll be up for auction in Sandton during Wool Week (28 May to 3 June) as part of Cape Wool's wool campaign. "Cape Wools SA, together with Sandton City, Nelson Mandela Square and The Campaign for Wool, will host Wool Week SA at Sandton City in Johannesburg from 28 May to 3 June 2013. During this week, visitors to Wool Week SA can enjoy a static wool display on Protea Court showcasing wool products and related activities, as well as a sheep art exhibition. A school education programme will also be shown during this week with wool information aimed at school children. A first for Nelson Mandela Square is the live sheep that will be displayed to the public on Saturday, June 1, followed by a sheep art auction that afternoon where Jo-Ann Strauss will be the MC. She, along with two models, will be dressed in wool by Hendrik Vermeulen Couture. As part of the static display in Protea Court, Cape Wools SA will encourage local knitting groups to join hands and knit scarves for the Expresso School Scarf Drive. Wool yarn sponsorships for this project from African Expressions have already been secured. African Expressions has also committed to some finished scarves, which they are currently working on. For more information on Wool Week SA, please contact Cape Wools SA at 041 484 4301." I just love your sheep! Hope it all goes well. Love your sheep! Good luck! Fascinating! I hope the event goes really well.